These devices have been set up in one of the Drummond rooms to a particular manner by Dr Rod Crawford. His combination of alien tech room measurement microphony, artistry, experience, and innate build quality gives us a musical event that equals the technical levels of systems in the $50,000 area. 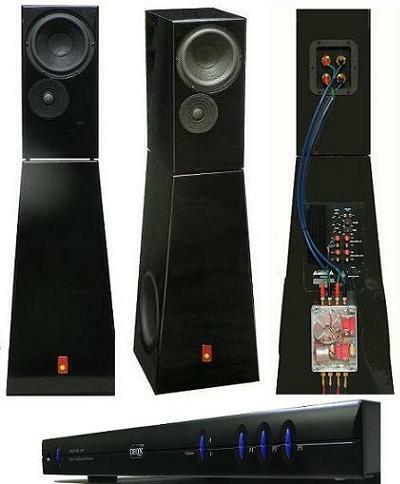 This ultimate stereo loudspeaker system offers a modular path to a potential specification that is of a unique caliber in the industry. In our set up at the moment we are running a Chord CD transport (nice Chord Blu...) into the DEQX processor, with the signal then passed to a pair of Chord amplifiers for the mid and treble of the system. We are using Nordost Valkyra speaker cables and Moonglo digital. The Kurlo Bipolar Subwoofers are running off their own internal amplifiers to produce a high end, tri-amplified, fully digital crossed-over set of loudspeakers that look a bit like a minimalist fantasy dalek.